I was reading Lynne's blog and she mentioned she had been to Dawn's blog Sweet as Cinnamon where readers are asked to give an explanation of their blog name in a giveaway. I've been blogging in various forms for many years now. I had a diary at diary-x and, like many others there was very annoyed when the whole thing crashed and we discovered that the owner of the site had no back-up although we had been told this existed. This was really more a diary than a blog and the entry for the day came at what would be the bottom of the page rather than the top like a blog. This was personal and I'm sorry it's gone. I've learnt my lesson. I run a Mac (RIP Steve Jobs and thanks). I use Time MAchine and an external hard drive and my machine is totally backed up several times a day to the external drive. When that fills, the program starts the back up again at the beginning of the drive. Simple and such a source of peace of mind to me. I started another personal blog at Typepad but that's currently in abeyance. while I make up my mind about paying for another year. At much the same time, I came back to knitting and it wasn't long before I found literally thousands of knitting blogs. Most of these at the time were from the USA. I read eagerly and soon had a long list to read. These were mostly called something cleverly linked to do with knitting, so I cast round (pun unintended ) for a name for the blog I planned. So pass the slipped stitch over was born. I used Blogger and have been through several incarnations of this. I can assure those who have problems now that these are nothing like the turmoil and frustrations the early Blogspot could arouse in me and others. 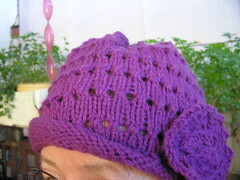 For a long time this was pretty well knitting only, but as my life changed, I began to include other bits and pieces. 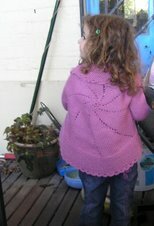 Knitting, whinges, trial, kindnesses, support, grandchildren have all been part of this. About fourteen months ago I bought my own domain name. I looked for something to express how I was feeling in the name but my favourites were taken. The URL for my blog now mentions the passage of life as I moved from one stage of life to another. I still use Blogger to post to this domain. I no longer feel guilty if I don't have knitting mentioned. To feel this way is silly really, it's my blog to write as I wish. However, I do try to keep track of projects. In fact, writing this entry is taking time I had promised to myself would be devoted to sorting out the next stage of my Catkin shawl. Back to the needles! As you no doubt remember, I had a seven month hiatus from blogging. Now that I'm back, I feel like my blog is mine and I write what I want with only rare moments of "I wonder what they will think?" I would like more followers, but it is what it is and I am happy with my ramblings. The fact that I have made friends like you in the process is a wonderful bonus! Happy blogging through the passages of your life!